As chickens get older, the quality of the egg that they lay will deteriorate. Older birds will lay eggs that have more watery albumen (what we call egg white). High egg producing strains (hybrid layers) seem to be more susceptible to this. It’s no surprise considering the number of eggs they lay in their early years is far greater than any pure breed of hen. For example, ex-battery hens will often lay lower quality eggs with thinner shells and more watery whites a few years in to rescuing them. The most common cause of watery whites is simply the age of the egg. Storing eggs in high temperatures and low humidity will speed up the ageing process and cause whites to become watery. 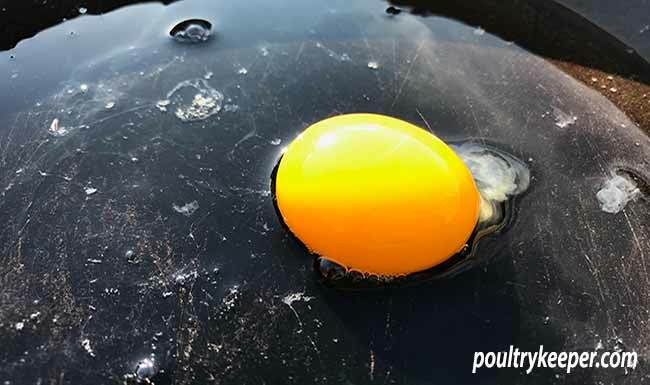 Often when backyard chicken keepers are complimented by their ‘fresh eggs’, this is not just the deep egg yolk colour from free range hens but because the eggs are only days old so do not spread in the frying pan. This is a normal, fresh egg white supporting the yolk laid by one of my free range hens. 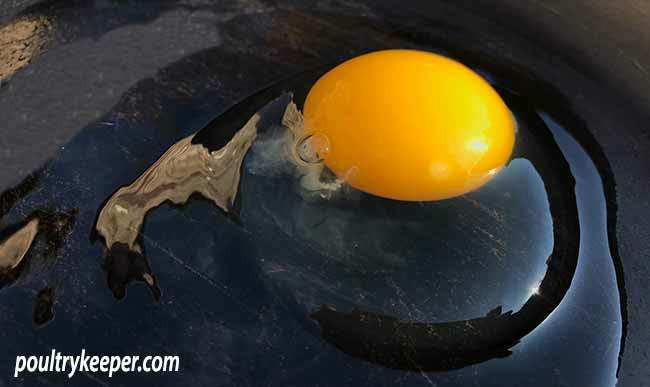 A fresh egg will ‘stand-up’ when cracked into a frying pan and most of the egg white will support the yolk with a little spreading across the pan. Some diseases such as Infectious Bronchitis can also affect the ability of the bird to produce thick albumen (white) so even if the hen has made a complete recovery, she can still lay eggs with watery egg white for the rest of her life. Eggs are still safe to eat, they just aren’t so appealing if they spread across the pan and can be less attractive to eat. Watery egg whites can cause more misshaped, wrinkled egg shells and if combined with thinner shells, can cause eggs to break easily leading to vices such as egg eating because eggs break more easily. A watery egg white will spread across the pan. You can test an egg for watery white, simply by cracking an egg onto a flat surface such as a plate and seeing how much it spreads out across the plate (or frying pan in the picture above). There is actually a measure of how watery eggs are where the height of the white and the weight of the egg are measured to give a measurement in Haugh between 0 and 100. The lower the Haugh value is, the more watery the white is. This measurement is only normally used in commercial egg production and the minimum value of 60 is usually required when eggs are sold in the shops. Remember, watery egg whites are perfectly normal for older hens to lay and can be safely eaten, providing they are fresh and shells have no cracks in them (which can let bacteria in). Most of our older hens in a back garden set up will lay eggs well below the value of 60 Haugh that is acceptable for shops.